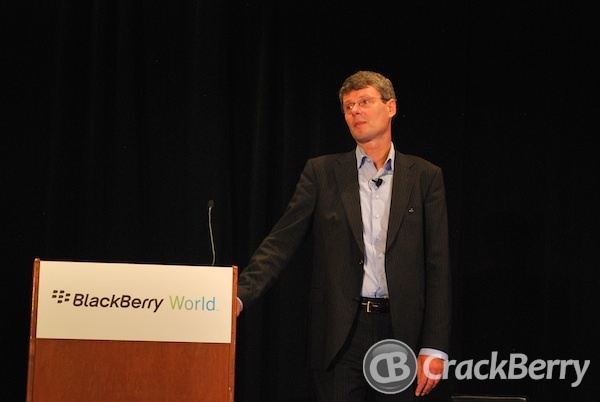 Listen to the full audio recording from the BlackBerry World press session with RIM CEO Thorsten Heins! We already wrote about the awesome session that was held at BlackBerry World 2012 between the 150+ press in attendance and RIM's new CEO Thorsten Heins. Video recording wasn't allowed, but I did put the Voice Recorder app to use on my Bold 9900 and managed to capture the audio from the entire session. I highly recommend listening to it. Heins seriously Rock & Rolled it! Disclaimer 1: As noted, I recorded this on a Bold 9900 from quite a distance. There's some background noise and you'll have to crank up the audio and listen carefully, but you should be able to pick up most of it.